After Sir Terry Pratchett died last week (or was it the week before? – ed), the internet has been flooded with tributes. Then reddit got hold of it and it went a touch more geeky! This isn’t going to be a bit of an obit to the great author but more about how to keep his name alive on the Internet. Let’s start this how to by using the best, in my opinion, webserver. Apache. You can add it to the relevant .htaccess file or in the main httpd.conf file so all domains can serve the below new header. header set X-Clacks-Overhead "GNU Terry Pratchett"
Windows IIS is next. Add this to the web.config file. Don’t ask me where as I have no idea! If you don’t have access to this method then you can add any of the below in the code of the web page itself. This one has to go on the first line of the page, anywhere else will not display the page and produce a fatal PHP error. The final method that I’ll be covering is for static web pages that can’t work with PHP. All you need to do is add this in the <HEAD> of the page and then you’re away. I was a big fan of his work, however after his diagnosis for Parkinsons, sorry, Alzheimer’s came out I was worried that his quality would drop off. I got a couple of the Discworld books he released after that and it wasn’t the same. The sense of loss when he died was quite large. I was sad at his death as well as the rest of the Interweb. His last three tweets made the world smile. It was very much in his way. 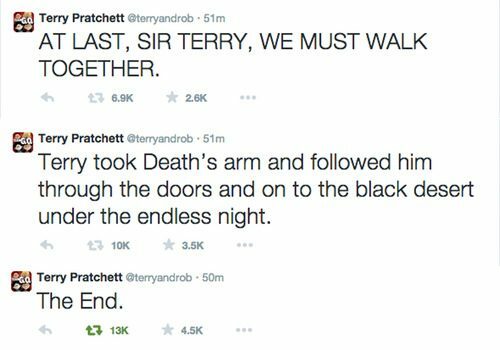 Goodbye Sir Terry. Your name will live on in the overhead of the Internet for, hopefully, as long as the Internet is there. This site is one of them that is broadcasting his name for all.